Music and storytelling are two sides of the same coin. Each is rooted in a personal truth and carries its own distinct rhythm and universal language. With such a wide variety of melodies, manuscripts & oral recordings to choose from, one is bound to find something that resonates within. Music and storytelling continue to allow us to connect with unknown worlds and individuals; relive forgotten moments, work though our emotions. Some elements frighten us, while others grab on tight to our curiosities imploring us to go beyond our comfort zones. Speaking of comfort & curiosity, who’s in the mood for an evening of fresh tunes and tales? 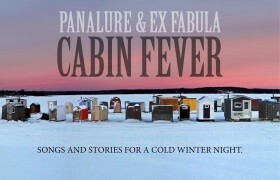 Ex Fabula and Milwaukee band Panalure are delighted to team up once again to present Cabin Fever, Songs for a Cold Winter Night. Join us February 13th at Anodyne Coffee Roasting Co., for a night of true, personal stories accompanied by original acoustic music from Panalure. This event was a HUGE success last year so be sure to get your tickets early! Grab your tickets today! Satisfy your curiosities about storytelling & StorySlams by clicking here. Need more stories in your life? 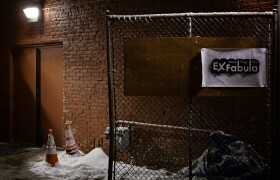 Join Ex Fabula February 16th at 3041 North for our next StorySlam. Come share, or simply listen to, real life narratives on the theme of Fatherhood. Tickets are available now! A big thanks to event partners SWC PENtastic Open Mic & Walnut Way Corporation, event sponsor United Way of Greater Milwaukee & Waukesha County and season sponsor Transfer Pizzeria Café. Lots more news to come! See you soon!